Professor Adrian Ivakhiv of the UVM Environmental Program and Rubenstein School has been named the Steven Rubenstein Professor for Environment and Natural Resources. Professor Adrian Ivakhiv has been named the second Steven Rubenstein Professor for Environment and Natural Resources at the University of Vermont. 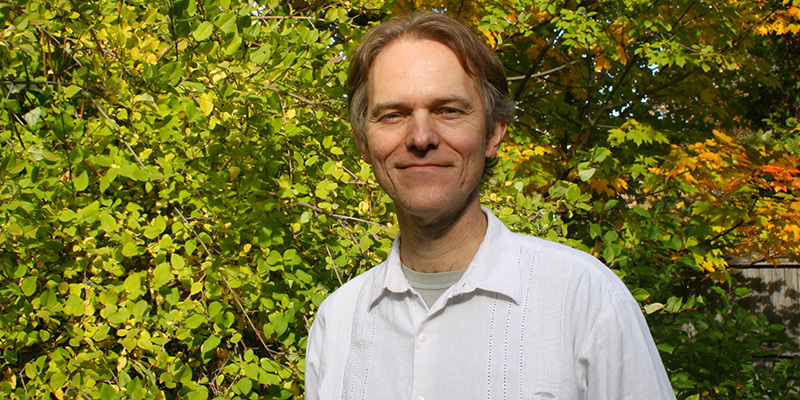 The three-year appointment, beginning September 1, 2016, in the Rubenstein School of Environment and Natural Resources will enable Professor Ivakhiv to develop the foundations for a proposed UVM center in eco-arts, media, and culture. This work builds on over a decade of his efforts to centrally establish the humanities and creative and communicative arts within environmental scholarship and action at UVM. “We are delighted to honor Dr. Ivakhiv’s scholarly accomplishments and creative works, integrating environmental humanities, arts, and sciences," states Dean Nancy Mathews. "His appointment as the second Steven Rubenstein Professor in the Rubenstein School aligns with the campus focus on environment and the arts. During the next three years of his professorship, Dr. Ivakhiv will be instrumental in raising awareness of the complementarity of art and the environment, and the importance of the arts in telling the environmental story." In this professorship, Ivakhiv’s goal is to transition the vision for an environmental arts and humanities center at UVM into a tangible plan that will lead to something lasting and sustainable. The center will incorporate equal parts critical research and practice on environmental communication through the arts and media. “The research part, led by faculty and students, will include critical analysis of how artists, media producers, as well as environmental activists are succeeding – or failing – at communicating the urgency of environmental issues to the broader public,” he says. The practice component will include events, speakers, and “media mentorship” for Rubenstein School faculty and students. As he develops the center over the next year, Ivakhiv will visit important international nodes of the environmental arts and humanities, such as Stockholm’s Environmental Humanities Lab and the Rachel Carson Center in Munich. His travel includes field research and speaking engagements at locations such as the Visual Culture Research Center in Kiev and Ukrainian Catholic University in Lviv, Ukraine; the Swedish Royal Institute of Technology in Stockholm, where he'll speak at the Stories for the Anthropocene Festival; the University of Amsterdam’s School for Cultural Analysis; Ibn Zohr University in Agadir, Morocco; Taiwan's Taichung University; the University of Oslo in Norway, where he’s a keynote speaker at a conference called “Reassembling Democracy: Ritual as Cultural Resource;” a symposium on the “spiritualization of ecology” at the University of Lausanne; and the “Nature in Process” conference at the University of the Azores next summer, among others. A Professor of Environmental Thought and Culture, jointly appointed in UVM’s Environmental Program and the Rubenstein School, Ivakiv’s work and research focus on intersections of ecology, culture, identity, religion, and philosophy (among other things) across numerous disciplines. He has organized several groups of interdisciplinary environmental scholars at UVM including the Lattie Coor Environmental Humanities Fellows and BASTA! (Bridging the Arts, Sciences, and Theory for the Anthropocene), which recently hosted the 6X HOWL event. Ivakhiv’s appointment follows that of Professor Robert Manning, the inaugural Steven Rubenstein Professor, whose term ended August 31 and who retired this year. The Steven Rubenstein Professorship for Environment and Natural Resources was established as part of a $15 million gift commitment to the Rubenstein School in 2003, the largest individual gift commitment in university history at the time. The gift included funding for doctoral student fellowships, undergraduate scholarships, the Steven Rubenstein Professorship, a dean’s fund to advance strategic initiatives in environment and natural resources, and the Greening of Aiken project, which concluded in 2012 with national acclaim as one of the nation’s most ecologically sustainable college building re-designs.